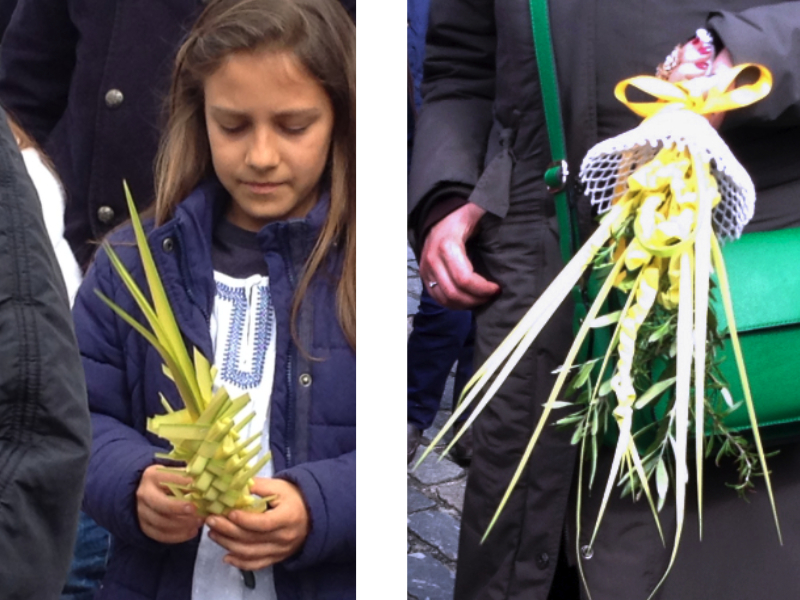 Palm Sunday: Procession or Cortege? Along the side of Camões Square, following the riverside and up the main avenue leading to the Igreja Matriz - the parish church - the people of Ponte de Lima gathered quietly on Palm Sunday morning. Their deportment was reserved, their conversation subdued. From a distance we could hear a solemn beat approaching, a beat quite unlike that of Minhoto music on other days of the year. At last, round the corner came the youth section of a band, girls and young men in uniform carrying banners, playing a dirge and and marching to the slow rhythm of their drums. Next came the brass section; the tubas, French horns, saxophones and cornets of the Bombeiros Voluntários, the Volunteer Firemen. 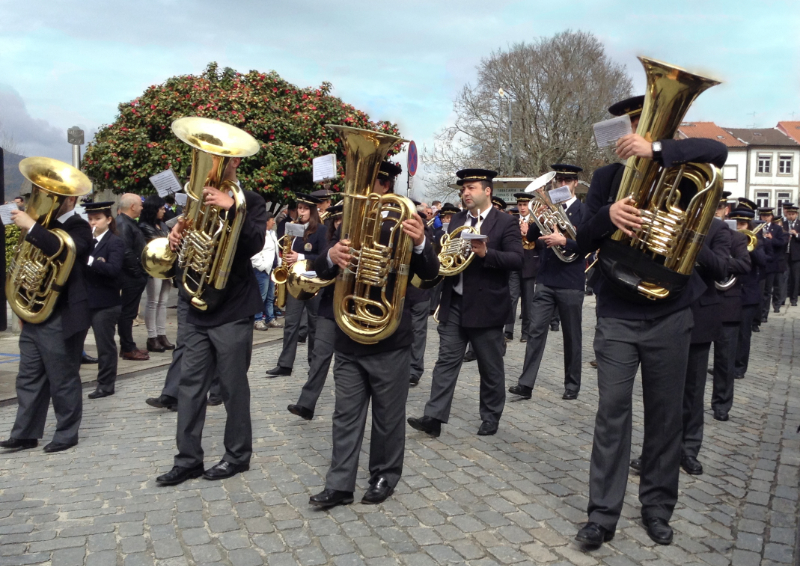 Just like the miners of my native Yorkshire, the Volunteer Firemen of Portugal keep up a proud tradition of brass bands. Pleasingly girls and young women are welcomed into their midst, though only one young woman can be seen towards the rear in this picture. This was a solemn occasion, almost funereal. It was a 'procissão'. On a previous, much happier occasion, I had asked a lady by the roadside at what time the procissão would begin. Her answer puzzled me. "There's no procissão, today," she said, regarding me as if I were some sort of outlandish being who'd just dropped in from Mars. Clearly everyone except me knew that there wasn't a procession and yet ... I knew, I absolutely knew, that there was one. It was the final day of the Feiras Novas, the biggest festival of the year and I knew there was a massive, colourful, noisy parade and pageant every year on this day. "But," I stammered, "Surely every year there's a procession with dancers, singers, floats..."
"Oh!" she said, "You mean, when is the 'cortejo' going to start? A procissão is religious, solemn, quite inappropriate for today." So that was me told! 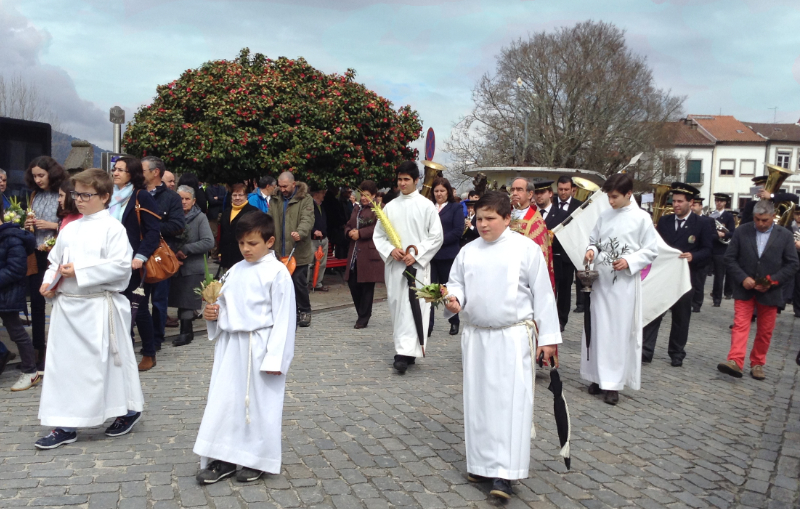 Yet strangely, what was happening on this Palm Sunday, to anyone with an English language background, would seem far more like a cortège, as we understand the word, than a procession, which is what it was to every Portuguese person there. The people lining the road fell into step behind the band and the priest, most of them, men women and children, clutching olive branches or elaborate palm posies. At the church the band stopped and waited as the people filed into church; so many people that there was hardly even standing room at the back. Not being catholic, we only peeped in and listened to some hymns and the Lord's prayer, which is a kind of aural Rosetta stone. Even if you didn't know a word of the language you would still know what was being said because the cadences are just the same in Portuguese as in English. We left as communion began. And now, I expect you will be thinking to yourselves, "The next post will be the happy Easter festivities". Well, I'm sorry, you are wrong. It would almost certainly have been about Easter if we hadn't suffered the frustration of a truly First World problem. The weather was dire at Easter, heavy cloud and torrential rain so we decided to stay in our friends' house some seven kilometres away till the very last moment... at which point there was a power cut. The gate was electric and, with no power, we couldn't open it to get out! You will not be surprised to know that Easter is not the best time to be calling out the electricity company for emergency repairs. We missed everything. 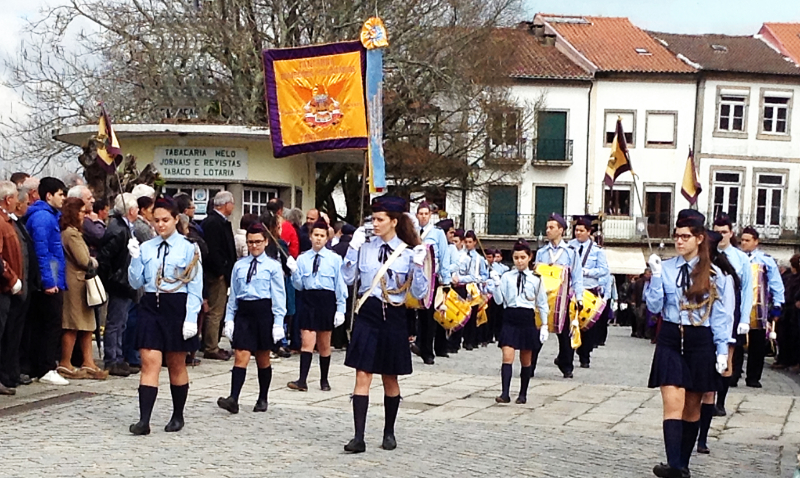 So I'm afraid the Easter customs of Ponte de Lima, some of which are curious, must wait until next year. So interesting to read about a country I don't know anything about and which I'll probably never visit. That however doesn't mean that I'm not interested in the long history, the culture, daily life, festivals, museums and particularly the inhabitants of Portugal. Add to this that Margaret is a born writer: witty, so knowledgeable and clearly so fond of everything concerning Portugal, that one wouldn't want to miss these stories! Thank you so much Tina. I'm glad you enjoy the stories I write. Do come back again for the next post which will be about a strange place which seems to be on top of the world. I, at least, felt on the top of the world when I went there because everything seemed idyllic. Perhaps you can live the experience through my post.